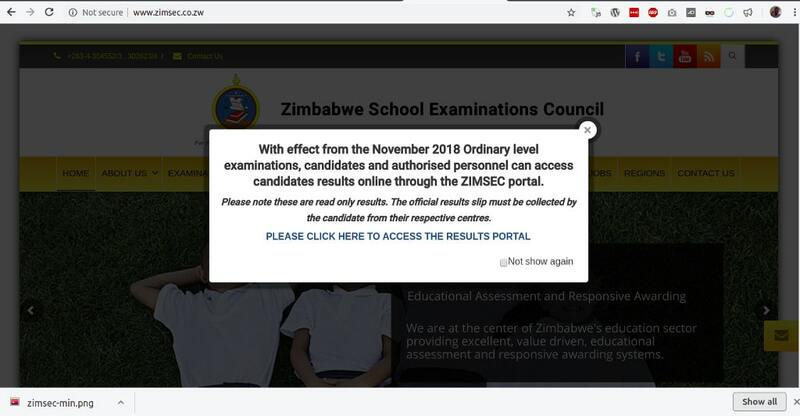 There has been a lot of excitement around the ZIMSEC results portal with a lot of parents praising the development as it allows their children and themselves to access the results from the comfort of their homes without to fork out money, a lot of money in some cases, to go and retrieve result slips from their former schools. It appears however the portal is currently down. Some students and parents expressed frustration before, as they could not access the site. This was mostly because they were trying to access the “wrong” site www.zimsec.co.zw. This is ZIMSEC’s main site and it was meant mainly as an informational portal and never to handle bucket loads of traffic that assaulted it when news came out that you could now view your results online. Even if you go to our article about the actual results portal, it is currently not working right now. Why? Well it appears inaccessible for some reason. It could be, in order of varying likelihood, off, it’s internet connection got cut off, it’s a DDoS, the software server is not running, a reverse proxy is down. I know when it comes to these things I am supposed to use services like isup.me but you have to agree this way seems much cooler and makes me look like a real nerd. Just to make sure I have also used isup.me but only after I did the above using different locations thanks to VPN. I can thus confirm the server appears inaccessible probably because of one of the reasons mentioned above. Well eat, love and pray and hope it comes back online. Government servers go down all the time, not even ZIMRA is spared downtime despite being the government’s little pig bank. There is also the eMap server, I like to joke that it is hosted on a flash drive that the admin carries around but past experiences have shown me that such jokes are actually closer to the truth than you think. Let us wait for Dandemutande and ZIMSEC to respond.In a twist of fate, the main ZIMSEC website (the one you cannot use to view your results) is now up and very accessible at the time I am writing this.